Can you admit this powerful evidence of current drug use at your car accident injury trial? It’s likely your lawyer wants the evidence admitted to show wantonness (recklessness) so the jury can consider awarding punitive damages. That’s just the issue Alabama’s Court of Civil Appeals considered in the recent case of Carter v. Haynes. 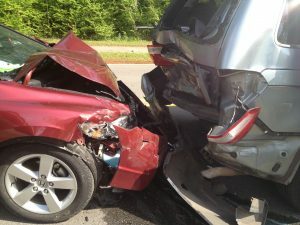 In the Carter case, the defendant driver rear-ended the plaintiff’s truck. The defendant admitted he was talking with his girlfriend and looking away from the road. He admitted he did not have time to stop after seeing the other cars stopped in front of him. He was a distracted driver. The defendant driver negligently caused the crash. He should be accountable for any injuries he caused. That’s the purpose of compensatory damages. What about punitive damages? Was he reckless, warranting punishment? That’s where the drug evidence enters the picture. If he chose to disregard the safety of others and drive while intoxicated, punitive damages may be warranted. What did the drug evidence reveal in the Carter case? On the morning of the wreck, the defendant received his daily methadone treatment (for opioid addiction). After receiving his methadone, the defendant went home and smoked marijuana. But, he did not drive at that time. He drove his car 6 hours after smoking the marijuana. The defendant testified he drove hours later after the effects of the drugs were gone. And, the police officer at the scene did not notice any behavior suspicious for intoxication. So, the trial court excluded the evidence. Without evidence indicating that Haynes was impaired at or near the time of the accident, we cannot say that the trial court abused its discretion in excluding the evidence of Haynes’s use of marijuana and methadone on the ground that it was unduly or unfairly prejudicial to Haynes. A car crash defendant’s drug use may be admissible on the issue of recklessness. However, that evidence needs to show impairment around the time of the crash. In other words, it needs some connection to the accident. Without this connection, it is unfairly prejudicial. Let me add — While the Carter case considered drug use offered on the issue of recklessness and punitive damages, there are other arguments and reasons why drug use might be relevant and admissible in car accident cases. Evidence may be admissible for one reason but not another. Good lawyers know that. The use of evidence depends upon many factors at trial. That goes back to one of my earlier thoughts — You need an experienced trial lawyer who understands those rules if you want to put your case in the best position. And, your lawyer needs to investigate and prepare the case fully. At the Blackwell Law Firm, we specialize in personal injury cases. Many of these cases involve injuries caused by an impaired, intoxicated or distracted driver. We understand the rules and we prepare our cases fully for trial. If you have questions, give us a call. Consultations are always free and confidential.